This week in the war, in an effort to break through the Gustav Line, Allied planes bombarded Monte Cassino. The world renowned Benedictine abbey was completely destroyed and the bishop and a number of monks were killed. General Bernard Freyberg, commander of the New Zealand Corps, had supported the bombing. He was convinced that German soldiers had occupied the abbey and were using it to their advantage. In truth, Field Marshal Albert Kesselring, the German Commander-in-Chief in Italy, had instructed his troops not to enter the abbey, in fact to not even go to within 300 metres of the buildings. Kesselring had also had also given instructions that the abbey’s ancient manuscripts be moved to the Vatican for safekeeping. In the end, the Allies gained nothing. 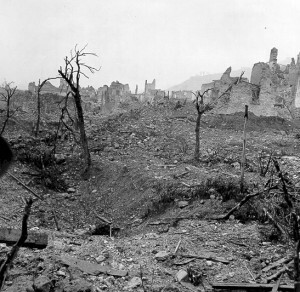 After the bombing, German paratroops entered the ruins, set up their guns, and turned the entire area into a fortress. 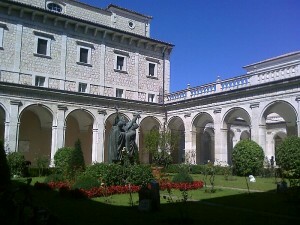 The abbey was rebuilt in the decades following the Second World War and was reconsecrated by Pope Paul VI. This entry was posted in World War II and tagged Bernard Freyberg, Gustav Line, Italy, Kesselring, Monte Cassino. Bookmark the permalink.